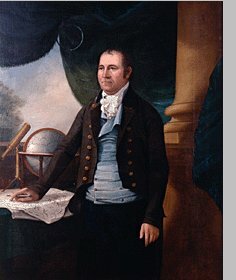 Simeon De Witt was the Geographer and Surveyor-General of the Continental Army during the American Revolution and Surveyor General of the State of New York for the fifty years from 1884 until his death, a time of rapid expansion into the Indian lands of the central and western New York. De Witt grew up in Wawarsing in Ulster County, New York, one of the fourteen children of Jannetje Vernooy and his physician father Dr. Andries De Witt. Simeon was the only graduate of Queens (Rutgers) College in New Brunswick, New Jersey in 1776. With the capture of New Brunswick by the British during the war De Witt fled to New York City where he joined the Revolutionary army. In June 1778, having been trained as a surveyor by his uncle, James Clinton, De Witt was appointed as assistant to the Geographer and Surveyor of the Army Colonel Robert Erskine and contributed to a number of historically significant maps. Col. Erskine died from a fever in October 2, 1780 at age 45, and in December of that year De Witt was promoted to Ersikine’s former position. De Witt was married three times. In 1789, he married Elizabeth Lynott, the daughter of Thomas and Elizabeth Van Valkenburgh Lynott. Elizabeth died in 1793 after bearing two children. Around 1791 he married Jane Varick Hardenberg, a widow and niece of the New York City mayor. She died in 1808 — their son, Richard Varick De Witt, became a prominent civil engineer. Simeon’s third wife was Susan Linn. De Witt held four slaves at his residence in Albany, but by 1810 he had freed them, a common practice of the area, though they continued to work in his household. He owned a considerable of land in the Finger Lakes area and is considered one of the founders of Ithaca, New York. He was often given credit for giving classical Greek and Roman names to the 28 central New York Military Tract townships that his office mapped after the war, to be given to veterans in payment for their military service, but credit has been given more recently to Robert Harpur, a clerk in his office and apparent reader of classical literature.